The Tacony Creek, with evidence of trees damaged by beavers.The natural is often artificial in a city. It can take a lot of planning and work to get native species growing along the battered Tacony Creek, to keep the water unpolluted and the bed from getting scoured by runoff each time it rains. Thus it can be especially frustrating when a native animal foils your plans. One of the culprits.“They took out a strip of 50 trees near Rising Sun,” recounts Denis Mora, Philadelphia Water Department Water Conveyance Supervisor, with amazement. He is talking about beavers. Tom Witmer, Natural Lands Restoration Operations Manager with Philadelphia Parks and Recreation, had told me a similar story about another tree-planting along the creek, this one closer to Adams Avenue. “We like trees and planting trees everywhere because they manage stormwater, and trees in the park are no different,” explains Alix Howard, Director of Education and Outreach for the Tookany/Tacony-Frankford Watershed Partnership (TTF). The beavers don’t care. They just need food and building supplies, and planting a row of saplings is like giving them a combination buffet and hardware store. They fell the trees to munch the smaller branches and leaves, and use the wood for their underwater construction projects. These Tacony beavers are newcomers. According to the Pennsylvania Game Commission, by the early 1900s, trapping had extirpated beavers — rendered them locally extinct — across the commonwealth. The Commission released Wisconsin and Canadian beavers starting in 1917, and in a few decades beavers were spreading across the state on their own. A Fairmount Park inventory notes that there were no beavers in Philadelphia’s waterways as of 1903, and that as of 1999 they were living in the Delaware and Schuylkill. They only started appearing in Northeast Philly’s creeks (the Tacony and the Pennypack) in 2008, according to Mora. We’re used to seeing beavers in wilder areas, so photographer Christian Hunold and I immediately recognized the rough-chewed, pointy stumps we saw along the path. These were a couple years old, but the busy rodents will keep at it, gnawing down trees and — if we’re really unlucky — blocking culverts in their attempts to build ponds. 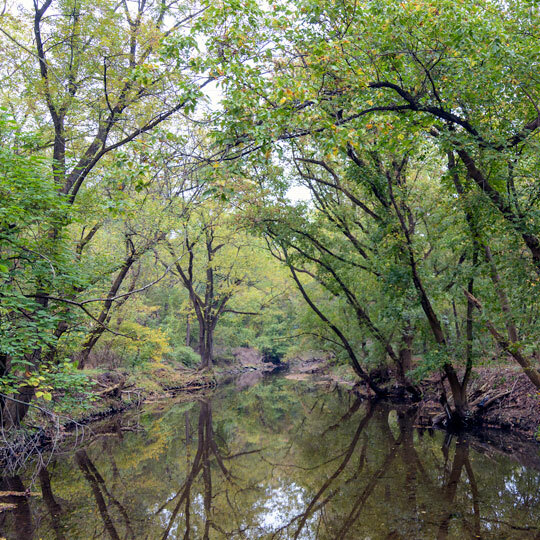 Known along its length as the Tookany, Tacony and then Frankford, the creek offers the same mix of natural respite and industrial challenges as other smaller Philadelphia waterways, such as the Pennypack and Cobbs. The earliest European settlers dammed creeks to power mills, and more recently we’ve been abusing them with pollution and exotic species that crowd out natives. Still, with all its problems, the Tacony offers the immediate peace and calm that I seek in a creek corridor: take a few steps down from the street and soon the slopes and trees block out the city. Clear water flows peacefully over the rocky bed. Fish hover in the pools. On our walk, a belted kingfisher chatters at us, and we spook a great blue heron as we walk along the creek. It seems like we could have been anywhere but North Philly. 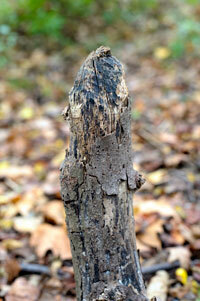 Suddenly the beavers didn’t seem so out of place. Bernard Brown is an amateur field herper, bureaucrat and founder of the PB&J Campaign (pbjcampaign.org), a movement focused on the benefits of eating lower on the food chain. Photos by Christian Hunold.